Hildy is a woman who has three big problems. First, she has brain cancer. Second, either the cancer or its treatment is causing her to see auras around people, and these are somehow related to each person's time alive. Third, her ability to see these auras has attracted the attention of strange and potentially dangerous people. Karen Heuler's novella In Search of Lost Time sets out these problems and follows Hildy as she tries to understand the uses and limits of her ability to see and even manipulate time: just from looking at someone's aura, she can assess how much time they have left alive. By looking closely, she can pick out particular parts of a person's past and identify the emotions associated with that time. And, most dramatically, she can grab it with her hands like cotton candy and steal it. It turns out that, by inhaling someone else's time, you can take it for yourself. This is a striking premise, but, like Hildy, the novella has three big problems. The first problem is Hildy herself, the protagonist. She's a forty-seven-year-old woman who is still grieving the loss of her lover, Noah, who died suddenly about a year before the start of the story. He was married to someone else and seeing Hildy in secret. The genre has made some progress but it's still the case that a forty-seven-year-old female protagonist is unusual enough to be interesting by itself, and her guilt (or really her lack thereof) about the affair, her grief over Noah's death, and her struggle with cancer are well-drawn and should give her a depth that's unusual in an SF protagonist. And yet...that's it. There's absolutely nothing else to her. Does she have friends? Does she have family? What life did she expect for herself before the cancer diagnosis? If she had more time, what would she spend it doing? A novella might be shorter than a novel but it's still long enough that the lack of any detail whatsoever about these basic questions eventually turns what should have been an interesting character into a cipher. To take just one of those questions, a cancer diagnosis might, to someone in grief already, seem just further confirmation of the end of a life she had been sharing with her lover. Or it might cruelly tear down a life she had managed to rebuild. As it is, the story doesn't show or even tell us enough about how these crucial events affect her and that substantially weakens the emotional impact. The second problem is the contradictory details surrounding the story's time-aura mechanic. There is a rich tradition in SF of the one-departure story: even though it's fanciful, suppose that very occasionally brain cancer causes people to see and manipulate other people's time...what would that mean? For much of the novella, Hildy acts like the hero of one of these stories, trying to understand her power through conversations with others who know about it and especially through her own experiments. She takes time from lots of different people in different circumstances, creating an elaborate labelling system for her samples. Yet for all her efforts, the power remains frustratingly vague and very fundamental questions about it are never settled—questions that seem like they would be resolved on her first day of investigation. The size of the auras seems to correspond to someone's remaining life, but generally the time Hildy takes from people represents time from their past. When she inhales it, sometimes she acquires merely the emotional state the other person was in at a particular time but nothing else. But sometimes she actually experiences that time as if she were living it herself, and can even learn things the person was thinking about in that moment. So maybe "taking time" really just means taking memories? Except every character in the story seems to believe that by taking time they can lengthen their own lives and shorten the lives of those from whom it is taken. There are terminally ill people desperate for other people's time and Hildy herself worries she may need it. Yet Hildy seems to experience the time she takes as a passive observer, so it doesn't seem like it's lengthening the time she spends actually living her life. Nor are the amounts of time involved large enough for sustainable changes. The most we ever hear of her taking is maybe two hours, so no one is getting a second lease on life from the jars we see being bought and sold. And what of someone's time to come? If Hildy steals future time, can she experience that person's future? None of this is ever settled for the reader, even though Hildy is presented as developing an understanding of her ability. Given the story devotes so much attention to Hildy's struggle to understand her ability, it's also a little surprising that the story never raises the possibility that she might allow her power to be scientifically studied in hopes that it could be better understood, perhaps allowing time to be duplicated or synthesized. This sort of realistic scientific investigation is, alas, kind of boring and so stories usually arrange things so that the protagonist is on their own. A common tactic is to claim no one will believe the protagonist, but in this case Hildy's ability to accurately read memories is easy to experimentally verify. In any event, the possibility apparently never occurs to Hildy at all, even to reject. The story's third problem is Hildy's habit of pausing briefly to consider ethical questions, then move on with whatever she wants to do without ever answering them. It's hard to like someone who isn't unaware of her impact on other people but who refuses to give it much thought. That her lover was married was merely annoying and inconvenient. Then, at the moment she discovers an ability to alter other people's lives that she doesn't understand, Hildy goes around taking time from practically everyone she meets, from people in the grocery store line to babies in strollers to old men in the park. Other than one pang of guilt after taking time from someone she likes, she never worries that this might have negative unforeseen consequences for these people. Throughout the story, Hildy focuses almost entirely on how everything that's happening impacts herself. Not all characters need to be likable, of course, but the story (told in the third person) indulges Hildy's self-interest. Though Hildy doesn't know it for much of the story, the time she's taking never seems to be in amounts large enough to make it seem like much of a crime. This feels like a way of excusing her behavior, especially since the very small amounts keep most of the other characters' motivations from making sense. There are brief moments when Hildy or other characters ask if she should be stealing time, but the only consideration that the story ever focuses on for more than a sentence or two is what should happen to the time, accepting as a given that it will be stolen. The initial proposition from another character is to sell it, but the characters who sell stolen time all turn out to be criminal or confused. Instead, Hildy gravitates towards a belief that she should take time from those who have too much and give some of it to those who don't have enough (and, it is implied but never quite stated, keep some for herself). She briefly wonders whether she has the right to decide how to distribute time but then, as is her pattern, just assumes she does and moves forward. The truth is that even though the novella has a couple of narrative tricks to play with the transference of time and memory, it isn't a rigorous exploration of what humans might do with this power. Perhaps we are meant to interpret this time stuff as metaphor, and to that end the speculative content of the novel is contrasted with Hildy's affair: by having her affair with Noah, time with Noah was being stolen from Noah's wife. This seems like fertile ground: who is doing the stealing in this case? Who is to blame? Traditionally society blamed The Other Woman, but maybe Noah is the real thief? Again, however, the story never addresses any of this ethically interesting territory—because Hildy sees it in different, more selfish terms: she had a little time—too little—with Noah; his wife had lots and lots of time with him. Meanwhile the metaphor the story actually dwells on is that of Robin Hood. Hildy's conclusion, not explicitly endorsed but never seriously challenged by the text, is that she should try to do the best she can to make minor improvements to the universe's vastly unfair allocation of time. This makes sense when translated in sufficiently vague terms back to real life: that in an unjust world, we have an obligation to do what we can to improve the world around us, however little that seems in the face of so much pain and suffering. And when we go out of our way to help other people, we are giving them the benefit of our time. Yet the story is consistent in using the word "steal." When we spend time with others, we're usually spending time that is unambiguously ours to give. What, then, about Noah? The story has a perfect opportunity to address this near the end when Hildy hatches a plan to steal memories of Noah from his wife, but doesn't go through with it at the last moment. Ultimately, the novella, at this point predictably, never considers what justice means for Noah's wife. Hildy doesn't back out because it would be wrong to steal these memories and possibly shorten this other woman's life, but simply because she decides she wouldn't be able to enjoy these memories due to annoying details like Noah's use of his wife's name. Hildy's final conclusion about her power is that she has a moral imperative to use it. "If no one took on the burden of stealing time, then no one would reap the benefit of being given time" (p. 117). This construction emphasizes that Hildy is the one taking on the burden: she's doing the legwork and she's taking on guilt about possibly making wrong decisions. Totally absent is the price paid by those from whom time is taken, possibly incorrectly. It's all about Hildy, thinking mainly of herself even as she decides she must help others. "If no one takes, then no one gets" is moral reasoning that can be used to justify any theoretically beneficial act: stealing money from the rich and giving it to the poor, certainly, but also killing those you think might do bad things in the future. Placing supposedly beneficial impositions on weaker societies also comes to mind, since the story's use of the term "burden" here recalls the now maligned idea of the White Man's Burden. We don't have to agree with a protagonist and it is to the story's credit that it raises these issues; but the cavalier handling of questions of justice is very frustrating. I highly doubt the author had murder or colonialism in mind, for example, so these implications suggest none of this has been thought through well enough. I feel like I might have really enjoyed a mundane story about Hildy, Noah, and her battle with cancer. But this isn't one of those stories where the speculative element is so small you almost don't notice it. The time aspect is right there in the title and is ever-present in the story, bringing with it too many conflicting details and unanswered questions. Maybe that's intentional. 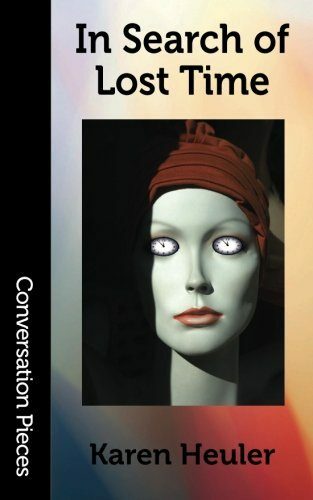 The novella is part of a series from Aqueduct Press called Conversation Pieces and In Search of Lost Time certainly raises a lot of interesting questions that are sure to provoke some interesting discussions among readers. I just wish the story's own contribution to the conversation was more carefully reasoned.